Comfort and casual contemporary style come together with this great sofa. Featuring a variety of neutral tone fabrics and tapered wood feet with a dark brown finish, this sofa with pillow arms adds an enjoyable place to relax in your home's living space. The 80-inch wide couch also offers a cozy seating for welcoming guests. 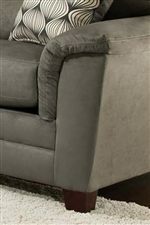 The 1070 Contemporary Sofa with Two Seat Cushions by American Furniture at AHFA in the area. Product availability may vary. Contact us for the most current availability on this product.